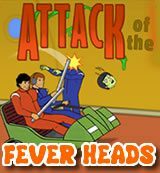 Cleanse Sealab of Green Fever! Hit Fever Heads with your cart all you want, but doing so will slow you down. Slow down too much and you'll get INFECTED!